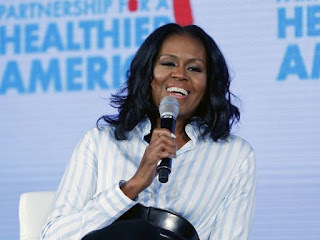 In this May 12, 2017, file photo, former first lLady Michelle Obama smiles while speaking at the Partnership for a Healthier American 2017 Healthier Future Summit in Washington. Former first lady Michelle Obama was in Southern California for spring break this week, enjoying some outdoor activities and fine dining in the Palm Springs area. Obama was in the Coachella Valley for four days, sources told The Desert Sun. She most likely stayed at the Rancho Mirage home of friends James Costos and Michael Smith. Costos is the former U.S. ambassador to Spain. Smith, Costos' long-time partner, is the interior designer selected by the Obamas to decorate their private quarters at the White House. Staff with the National Parks Service confirmed Michelle Obama went hiking in Joshua Tree National Park. She was also sighted having dinner at Birba in the uptown district of Palm Springs with daughter Sasha and another woman. Michelle Obama was set to remain on the West Coast at least into Wednesday evening. She was scheduled to speak before a large crowd at Oracle Arena in Oakland at 8 p.m.
Former President Barack Obama was last in the area in February for a golf-filled Presidents Day weekend, but it's not known when Michelle Obama was last here. While in the White House, Michelle Obama accompanied her husband on at least two visits and made three known solo trips to the desert, including for the 2011 funeral of former first lady Betty Ford. Barack Obama has been to the Coachella Valley at least eight times. Rumors have long circulated that the Obamas were interested in purchasing a home in the area, but neither has ever confirmed this. The aircraft carrying former President Barack Obama and his wife Michelle Obama made several attempts to land at Palm Springs International Airport before getting diverted.